Finding it harder and more expensive to stand out on Amazon's crowded site, they're heading to Wal-Mart. Chad Rubin began selling vacuum cleaner parts on Amazon.com Inc. in 2008 and turned it into a multi million-dollar business. But in recent years, Rubin has found it increasingly difficult to compete on the cluttered site, where he has been forced to buy advertising that cuts into his profit. Last year, he decided to shift some of his business to an up-and-coming website where it&apos;s easier and cheaper to stand out: Walmart.com. "Amazon sells 25,000 different kinds of toilet paper holders," says Rubin, who is actually undercounting a product with more than 70,000 search results on the site. "How do you win and differentiate in that environment?" In the last year, thousands of merchants like Rubin have answered that question by signing on with Amazon&apos;s biggest rival. The notion of Amazon merchants selling through Wal-Mart Stores Inc. would have been risible just a few years ago. But much has changed. 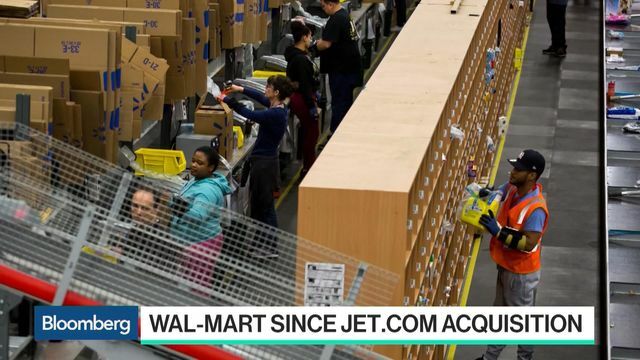 Wal-Mart&apos;s struggling e-commerce operations have shown signs of life since the company acquired startup Jet.com last year and put its co-founder, Marc Lore, in charge. Meanwhile, among merchants, Amazon has earned a reputation as a demanding and cranky landlord, kicking sellers off its marketplace when customers complain and reaching deeper into their pockets with steeper fees and new advertising products that merchants say are now required to get a sale. For merchants, Wal-Mart today is what Amazon was a decade ago: a vast frontier with room to grow. Amazon, meanwhile, is reaping the rewards of its popularity. It attracts 180 million unique web visitors each month, about double Wal-Mart&apos;s traffic, and can charge merchants accordingly to get a piece of the action. The overcrowding on Amazon.com is of particular concern to merchants generating almost all of their sales there. Last year, Robert Roque began putting inventory from his health and beauty business on Walmart.com and Jet. About half his sales are now on Amazon—down from 90 percent—due to the quick surge he&apos;s seeing on Wal-Mart. "We had to diversify," he says. "We could not sit back and depend on Amazon and have all our eggs in one basket." Wal-Mart has a long and contentious history with its suppliers—using its thousands of brick-and-mortar stores and millions of shoppers as leverage to pressure them to cut prices. The world’s biggest retailer has good reason to be more accommodating to its online merchants. While Wal-Mart&apos;s online store has generated impressive sales growth in recent quarters, it hosts mere thousands of sellers versus Amazon&apos;s two million-plus. Wal-Mart needs to catch up if it is to match Amazon&apos;s reputation as the Everything Store. "You don’t want to have a shopper look for something on your site and not find it, because you might lose that customer for good," says David Spitz, whose ChannelAdvisor works with Wal-Mart to recruit new sellers. A package moves along a conveyor belt inside a Wal-Mart fulfillment center in Bethlehem, Pennsylvania. Though Amazon&apos;s marketplace is open to virtually anyone who goes through an online registration process, Wal-Mart is invite-only because the company wants to vet sellers before giving them access to its customers. Typically third-party firms like ChannelAdvisor and CommerceHub invite merchants to join Wal-Mart and sell them software to make it possible to offer their wares on the site. "It didn&apos;t take much convincing," says Craig Vanderwier, internet sales manager for Maple Hill Golf, a family-owned golf retailer that had already been working with ChannelAdvisor for a few years. The charm offensive is starting to pay off: Wal-Mart now sells 50 million products online, up from about 10 million a year ago, narrowing the gap with Amazon, which offers some 350 million products. Not all companies are keen to sell their wares on Wal-Mart. Some high-end manufacturers refuse to list their products on the site because Wal-Mart is still perceived as low-end. "If the top two brands aren’t there, that’s a huge dent in sales," Vanderwier says. "Wal-Mart will run into some problems if they cannot get vendors to buy in." To get around that issue, Wal-Mart has been acquiring small upscale sellers, such as Moosejaw. It sells outdoor equipment and apparel, including products from Arcteryx, a maker of $550 backpacks and other upmarket mountaineering gear that cannot be found at Wal-Mart&apos;s brick-and-mortar stores. And vendors leery of selling on Walmart.com have no qualms about Jet. For now, it&apos;s much easier for merchants to stand out on Wal-Mart&apos;s online marketplace. They also benefit from Wal-Mart&apos;s huge investment in Google ads, a strategy Lore used to move product on Jet.com before selling the company to Wal-Mart. Rubin says his CrucialVacuum.com now gets 20 percent of revenue through Wal-Mart, which takes about 15 percent of each transaction. By contrast, Amazon gets about 30 percent, between the per-sale commission and the cost of buying advertising. So Rubin is benefiting from Wal-Mart&apos;s marketing budget, which is driving more people to his products. At Amazon, he has to increase his own marketing budget because there are so many competing products. Tim Werkley, whose logistics firm ships up to 25,000 packages a day, has seen un uptick in inquiries from online merchants looking to sell on Wal-Mart. His Swan Packaging, which helps merchants ship inventory to Amazon warehouses, is increasingly helping customers sell items on Walmart.com. "Wal-Mart is definitely the new frontier," he says. "You put yourself in a precarious position when you are only on Amazon."